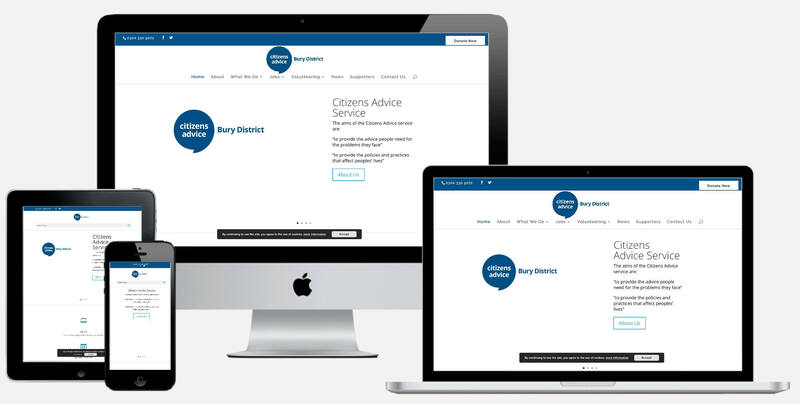 We worked very closely with Bury District Citizens Advice to understand their requirements and deliver them a modern fresh, simple to use and informative website to help their user’s find information easily and quickly. The design stage involved producing a complete creative solution for the website. Requirements included creating a clean and crisp feel without compromising user-friendliness, developing the brand affinity, providing a look that is visually stimulating wherever possible and allowing clear, simple navigation. Throughout the process providing an effective user journey was central to the project. burycab.org.uk has been built on the well-known WordPress CMS platform This allows Bury CAB to have access to a system which is customisable, scalable, intuitive and above all easy to use. The chosen platform means that the website works seamlessly across a range of devices and can be tailored specifically to the needs of the user.